Magento keeps searching for complementary acquisitions as part of their investment strategy. To provide merchants with a simple and functional tool to manage their webstore content, Magento acquired the well-known Bluefoot CMS & Page Builder module. 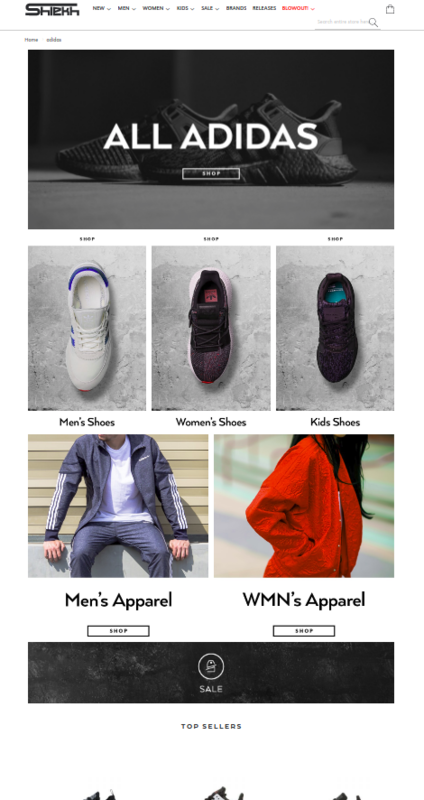 In this article we are going to review its key features and show you an example of a retailer, who used this module to add unique and creative content to his webstore pages. Bluefoot is a content management system and page builder, which allows non-technical users to quickly build customized pages without in-depth knowledge of PHP and Magento’s template system. It was developed by Gene Commerce Limited and acquired by Magento in December 2016. There is no support for Bluefoot in Magento 1, however, Bluefoot v1.0 is available for Magento 2.1 Commerce, and is compatible with Magento 2.2 Commerce. It’s also known that Bluefoot will be integrated into Magento 2.3 Open Source. If you’ve ever worked with page builders, it won’t take you too long to understand how functional and easy-to-use Bluefoot is. Drag & Drop. The interface of the module offers a number of blocks (headers, images, products, maps, etc.). All you have to do to build a page is to drag and drop these blocks onto the page and arrange them appropriately. Styling. There is plenty of styling coming with the module to create a customized design. Magento WYSIWYG integration. Utilize the module wherever you see the standard Magento WYSIWYG editor. Easy Third Party Content Integration. Complement your pages with YouTube videos, Google Maps and more to create content-rich pages, categories and posts. Static Block Integration. Smooth integration of static blocks into your page content to make sure that areas of the page such as categories can be designed appropriately. Open source code. Customize the Bluefoot code according to the needs of your webstore. Support. Bluefoot provides its customers with the best possible support, offers email support and explicit user guides. Shiekh Shoes is a famous footwear and apparel retailer on the West Coast of the United States, featuring athletic footwear from world’s famous brands. They have ongoing sales and replenishments they want their customers to be aware of. For that purpose they were looking for a tool, that would allow them to promptly create fancy pages and add new items to their collection without having to turn to a developer for help. So they decided to use Bluefoot as their CMS and page builder. The page displays a large Adidas banner with a “Shop” button on it, redirecting you to the general Adidas catalog. Below come the links to Men’s, Women’s and Kids shoes respectively, as well as Men’s and Women’s apparel. All sections have their separate “Shop” button. At the bottom of the page, you will find Nikes current sales and brand’s top sellers. Here we can see basically the same information as displayed on Adidas landing page, however, the product sections are arranged differently. 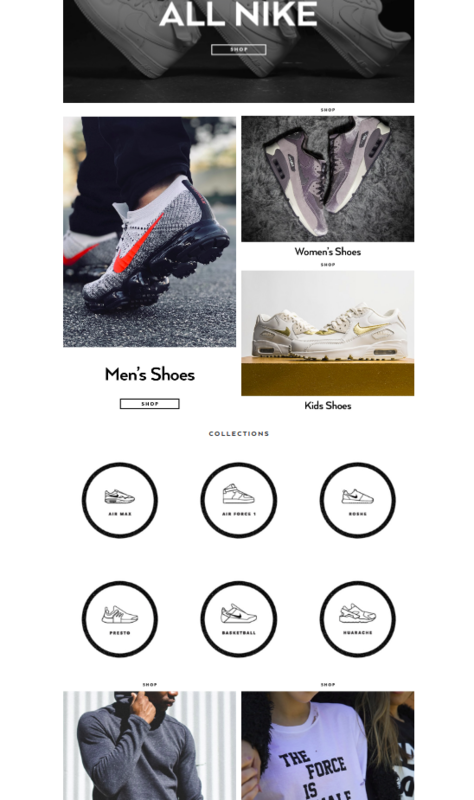 The page additionally features separate sections for Nike sneaker collections, each having its clickable sneaker icon, which is nice attention to detail. We believe that Bluefoot CMS will be fully integrated into Magento 2.3 Open Source, allowing online merchants to manage the content of their site, everything from product descriptions through to blogs. Most importantly, they will be able to do it independently without any technical knowledge, which means instantaneous content adjustments according to volatile needs of the market. Be sure to visit Shiekh Shoes webstore to see for yourself the possibilities that Bluefoot offers to online merchants.